Well, after a week-long hiatus from Investing.com, we were back in business this week. 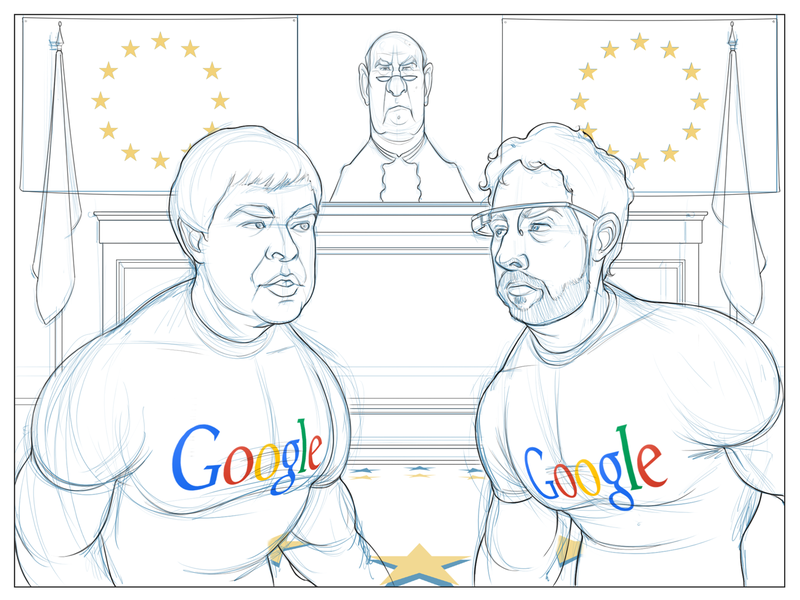 The comic this time around was about the current litigation against Google in the EU. 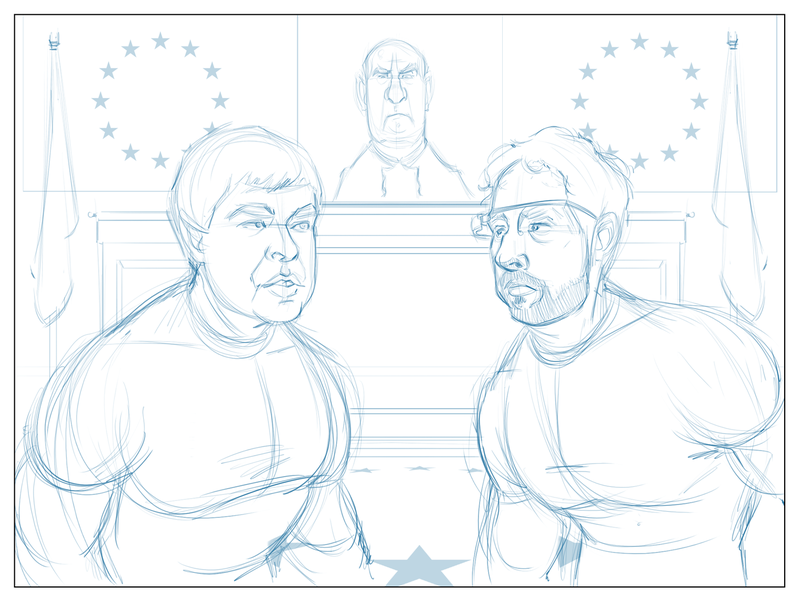 The good folks at Investing.com asked me to draw a courtroom. Specifically, they asked me to base the courtroom on the European Union Human Rights Court. 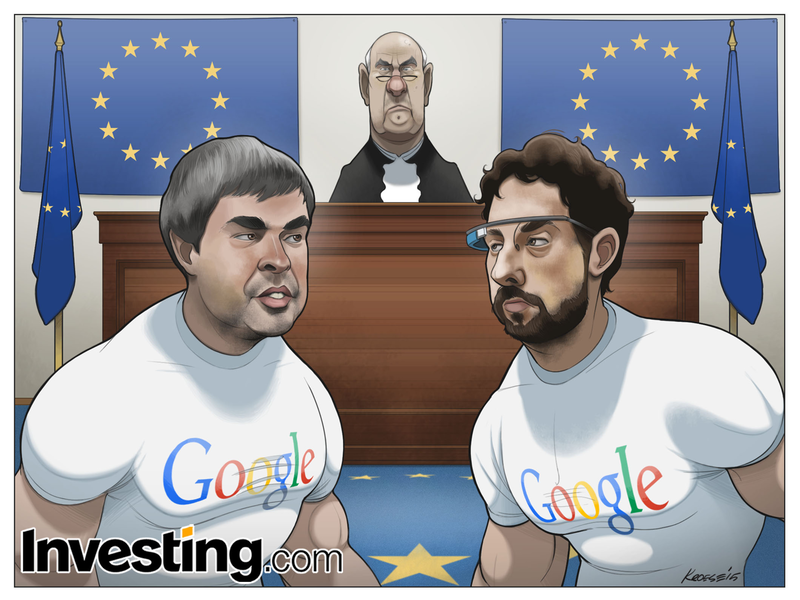 In that space I was asked to draw a judge behind a bench, some EU flags, and Google's top men (Sergey Brin and Larry Page). Brin and Page were to be super swoll (that's how the kids these days refer to people who are physically fit). The swoll-edness was a metaphor for the size of the company and the reason for the subsequent lawsuit. Sergey and Page are here to Pahmp You Aahp. If you weren't alive in the 90s, that reference won't mean much to you. Pretty fun comic this week, even though I felt a little rusty. I think the caricatures came out pretty well. Pretty well for a one-day deadline, anyway. The super-symmetrical composition wasn't ideal, but I thought it provided the best angle/perspective on the characters. Also, Larry Page looks like either a Vulcan or a Romulan from Star Trek. Something about that haircut and the eyebrows. The resemblance is uncanny. At any rate, that's all she wrote for this one. Until next week. 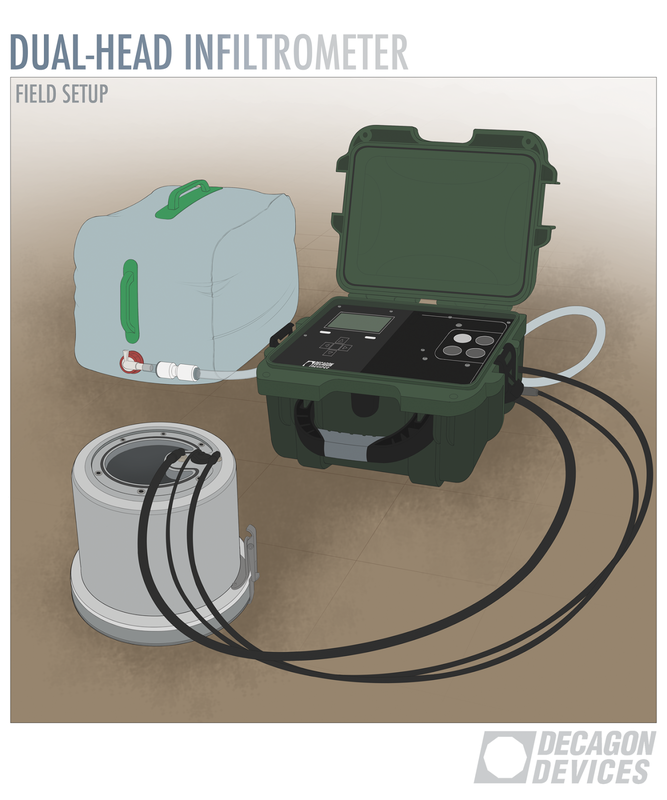 Here are two recent technical illustrations for Decagon Devices, Inc. 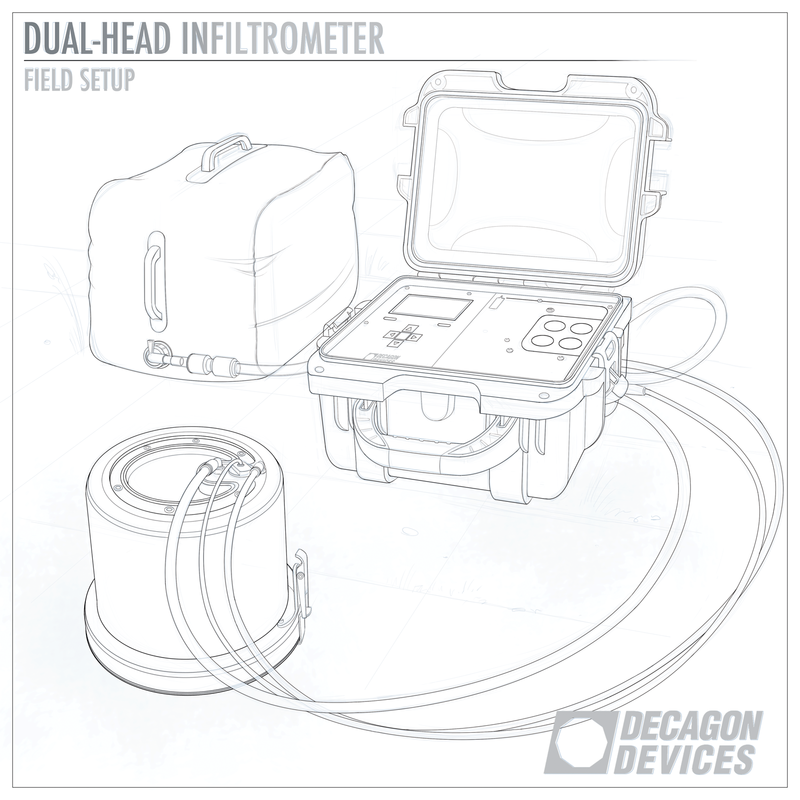 They're both of a new sensor called the Dual-Head Infiltrometer. 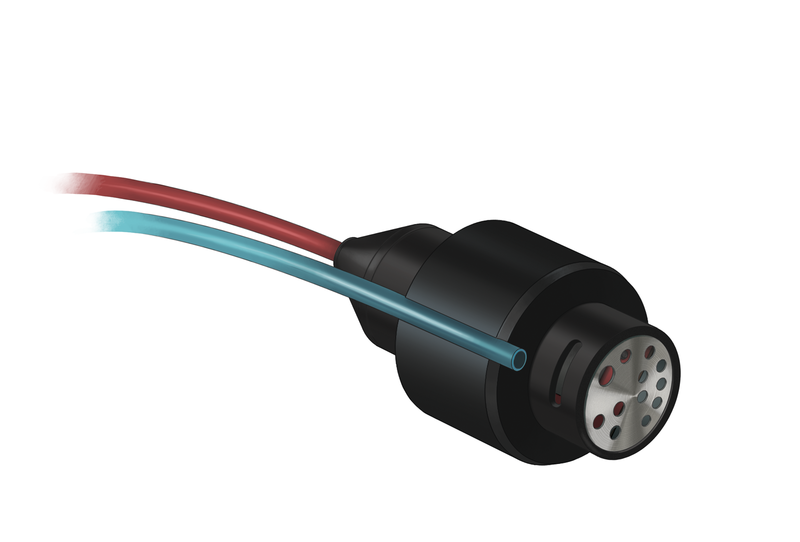 The sensor "measures soil saturated hydraulic conductivity, or Kfs. It is fully automated and requires no post-processing of data". That description came from the Decagon website here. 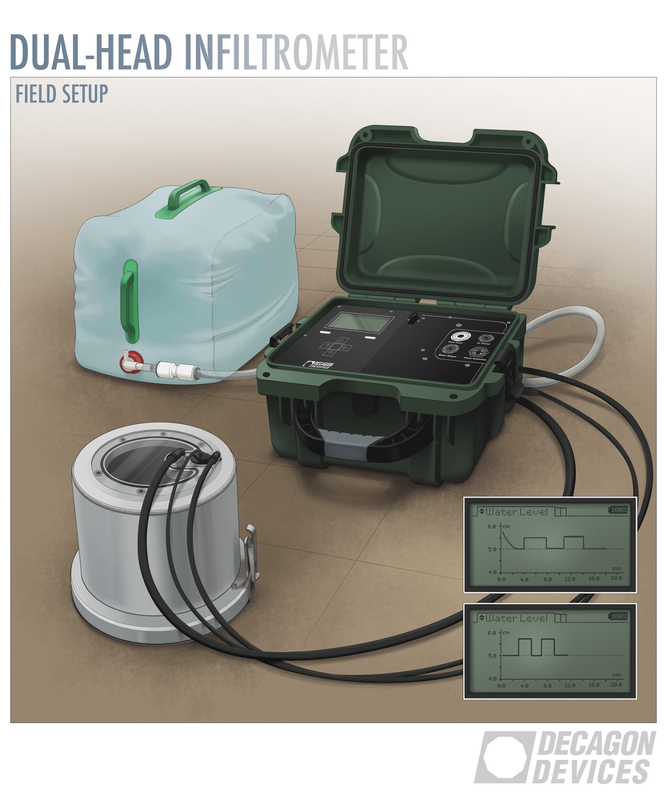 A description more accessible to a layman illustrator such as myself is that, among other things, the Dual-Head Infiltrometer measures how quickly a particular soil (or some other material) absorbs water. 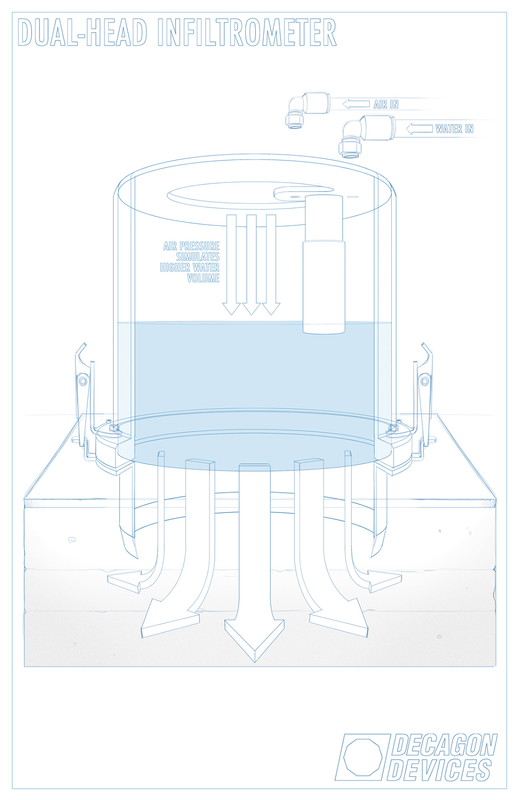 The DHI has three main components: A pressurized chamber, a field pump, and a water bag from which the pump draws its water for testing purposes. Like all Decagon sensors, this one was built for accuracy, ease of use, and durability. First, I was asked to draw a cross-section of the pressurized chamber. 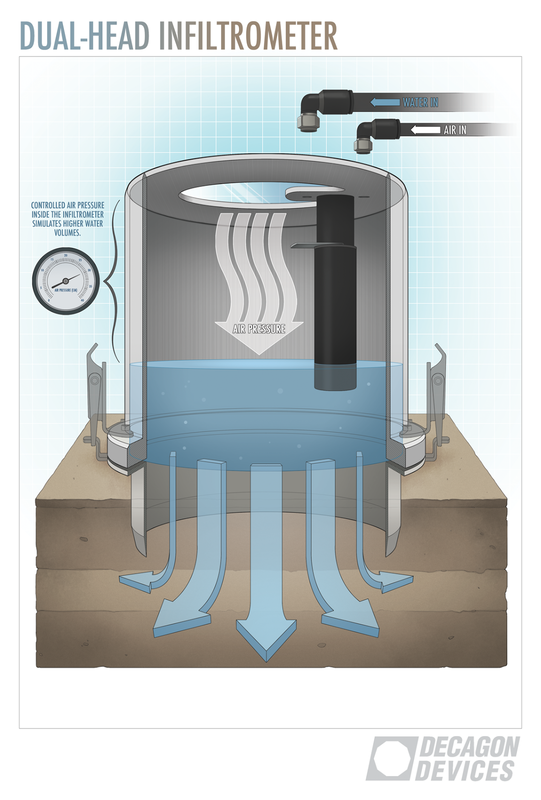 It needed to show the pressurized interior of the chamber and the area beneath the chamber where the water is absorbed 3-dimensionally into the soil (this area is known as the "wetting front"). This was a moderately-complex illustration. It's a cross-section/cutaway of a 3-dimensional object seen in multiple-point perspective. The trickiest part was figuring out how to create the cutaway section so that it stayed true to the sensor's construction while still keeping the whole thing visually clear and easy to understand. Fortunately, the sensor is a relatively simple shape (a cylinder). And it's also mostly symmetrical. These two factors helped. A LOT. As you can see, the final version has a pressure gauge on the left side and a slightly different arrow inside the chamber, which were included to help visualize the pressurized interior of the DHI. This illustration is a perfect example of why illustration is invaluable: It clearly explains the process and mechanics of the sensor, which makes it great for education and marketing. It's also a visual that's nearly impossible (or at least extremely difficult) to get any other way. The only way to photograph something like this would be to physically cut a section away from an existing sensor, which would be expensive, time-consuming, and unlikely to look particularly good in the end. Stock photography isn't likely to be much help in a situation this specific, either. This was a great job. I hadn't done an in-depth technical illustration for a while and it was fun, interesting and satisfying to have the opportunity to do so. 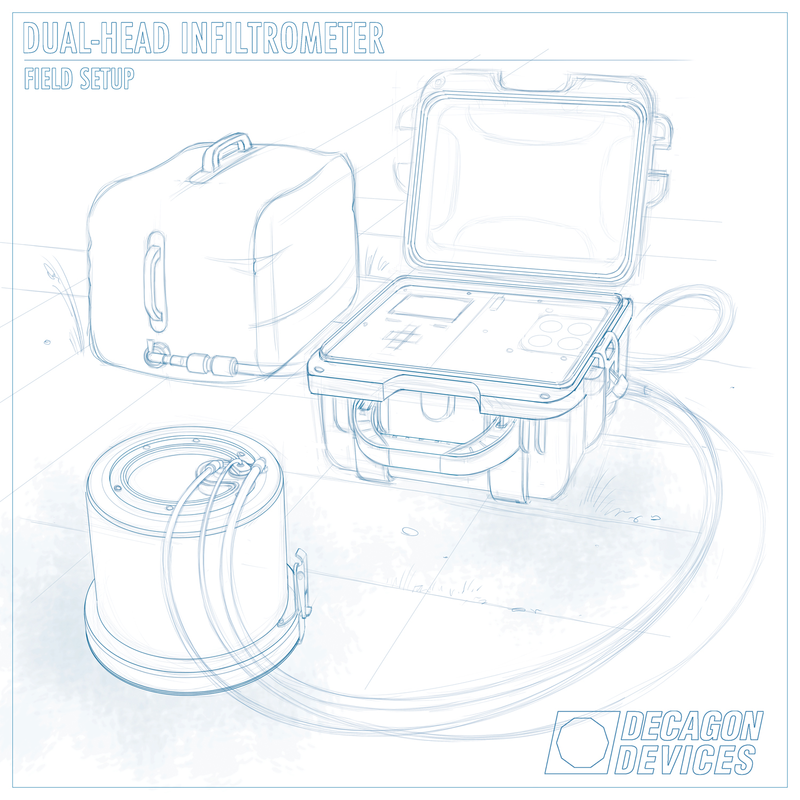 The second part of this job was an illustration of the Dual-Head Infiltrometer field setup, which is pretty much exactly what it sounds like: An illustration of the three DHI components as they look when they're being used on site. In terms of technical illustrations, this is probably the most difficult one I've drawn so far (three components, full color, multiple-point perspective, etc.). The toughest part was easily the pump (the green case), which is chock-a-block full of complexities. It was a lot of work. Fortunately, the amount of work was also commensurate with the amount of fun. This was such a satisfying piece to draw. I enjoyed pretty much every minute of it and I'm also pretty happy with the way the illustration turned out. So I'd call that a success. Investing.com: A relaxed meal with friends. Here's the latest comic for Investing.com. This week's comic involves ongoing negotiations between the U.S. and Iran over their nuclear program. -A Passover table with an Easter basket and Manischewitz wine. 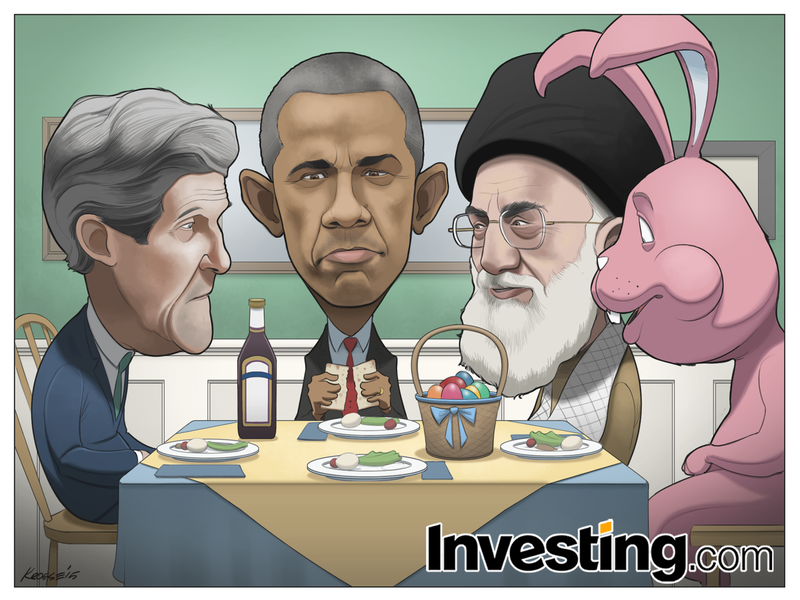 -Sitting at the table: Barack Obama (breaking matza bread), John Kerry, Ayatollah Ali Khamenei and the Easter Bunny (pink). Fun comic this week. Lots of work, but fun. 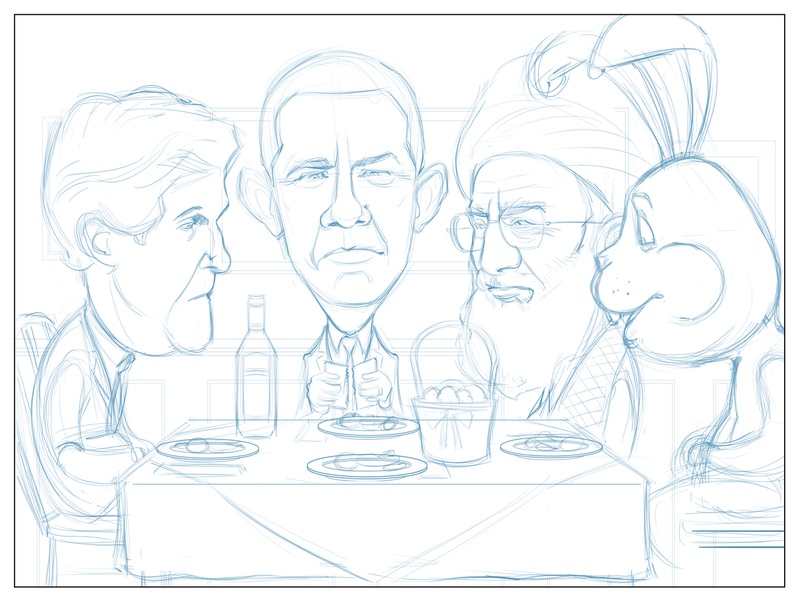 John Kerry is always a treat to draw. That's a face with a lot of character. 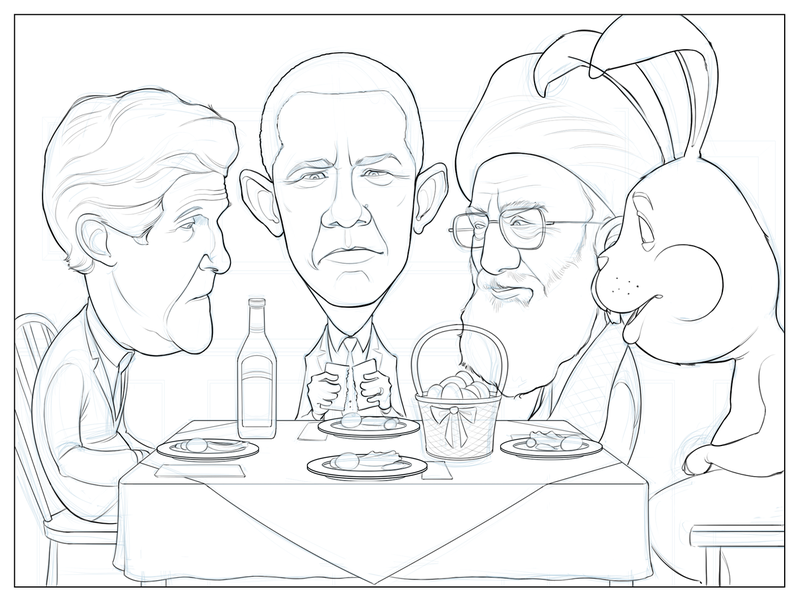 Plus, drawing Khamenei sitting next to a Pepto Bismol-colored Easter bunny was just surreal and excellent. I can't say I'm totally thrilled with the way the Easter bunny turned out, but c'est la vie. Overall, I think this is a decent comic and I had fun. Can't ask for much more than that.